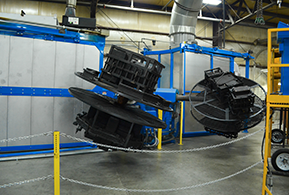 Technology Rotomolding (Rotational Molding) Services are plastic molding services which use a zero pressure process for producing hollow products. Resin, loaded into a closed mold, is heated as the mold slowly rotates on two perpendicular axes. The resin adheres to the mold surface, coating the surface evenly. The mold continues to rotate while it is being cooled, maintaining even wall thickness. Rotomolding is a fairly economical process for producing large hollow objects such as tanks, ice chests, etc. Advantages: Rotomolding services are able to produce large shapes that have few details on their surfaces. Applications: Rotomolding services are particularly suited to producing large, shell like objects with thick structural walls and reinforcing ribs.